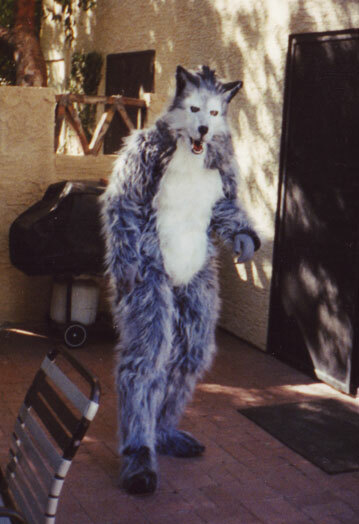 I took a pretty sizable jump from previous costumes I'd done in making my first wolf. 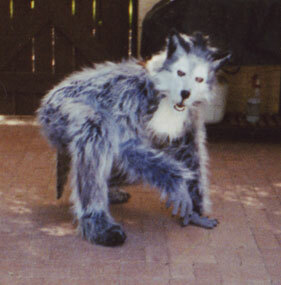 I'd worked with fur only slightly before, and hadn't done any entire mammalian or somewhat realistic-looking costumes. 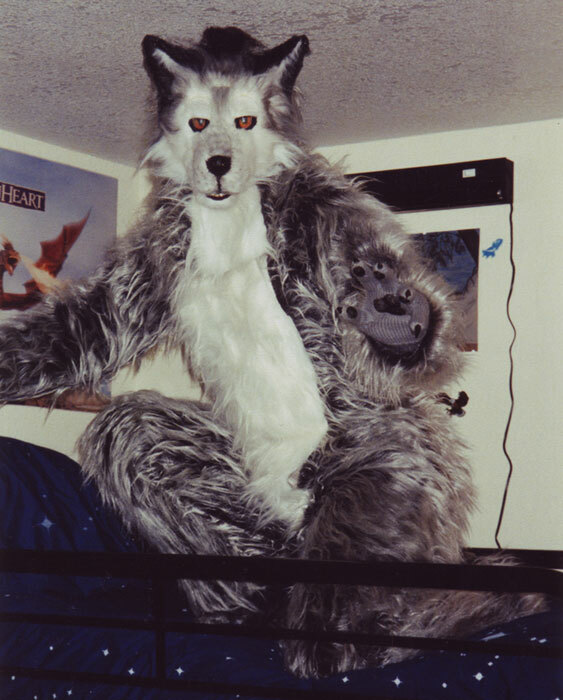 But I decided I was ready to try to make a fursuit. Looks-wise, I think this one turned out very good, and I've gotten a lot of compliments on it just from the pictures online. The structure was done badly, though, so the mask started to fall apart inside. As a side project, I'm working on repairing this mask so it'll be wearable once more. The mask's profile was kind of inspired by the movie "Bad Moon". 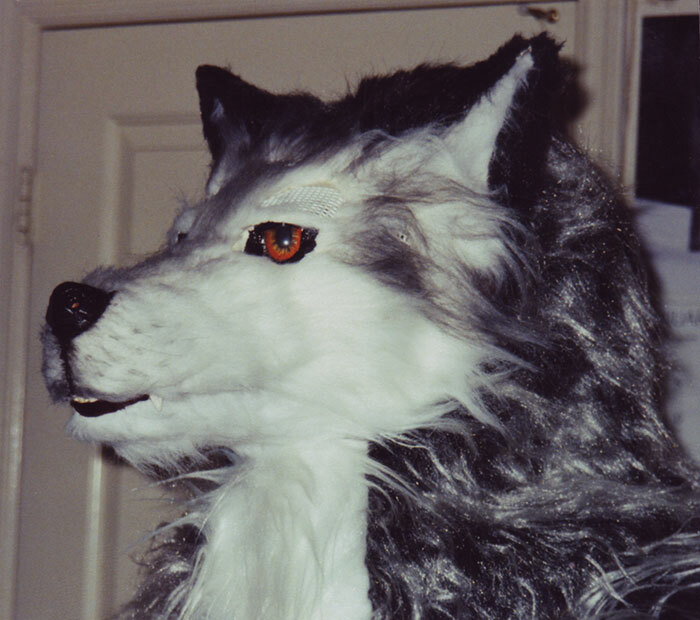 I noticed that when the werewolf turned to the side, the way the headpiece was done (with the face far forward, you can see it well in the fourth picture down on the left), it gave the werewolf the illusion of a long neck. 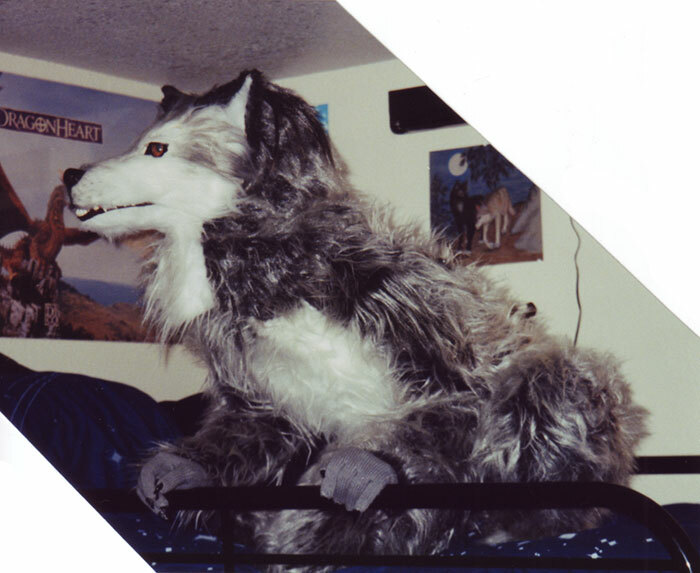 It would've been more successful on mine, except that the fur on the underside of the neck kinda destroys the illusion. 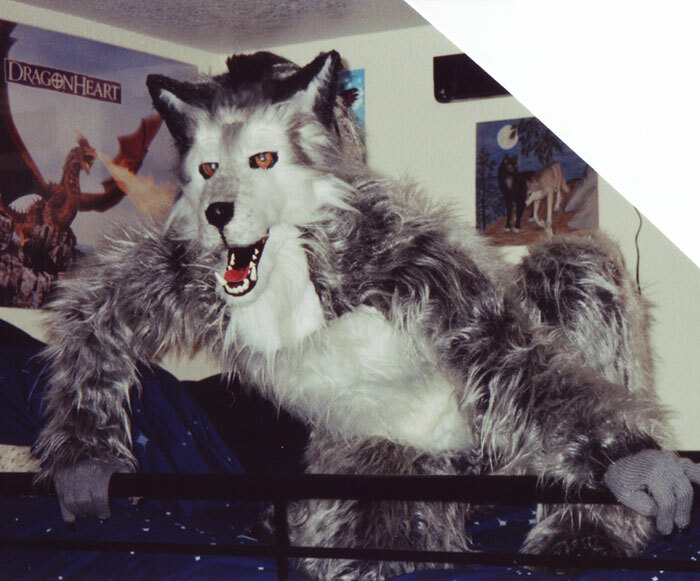 I couldn't tell until we got pictures developed; my vision in this mask was very poor. Oh, yes... The ability to see is a good thing. This mask was pretty poor in that respect. Ironically enough, the eyes were what blocked most of my forward vision. Another good point to remember is that you can see through black plastic mesh a lot easier than white or clear plastic mesh. It has to do with how they reflect light. If you don't believe me, put a piece of black and a piece of white in front of each eye, and face a lamp. It makes a *huge* difference! 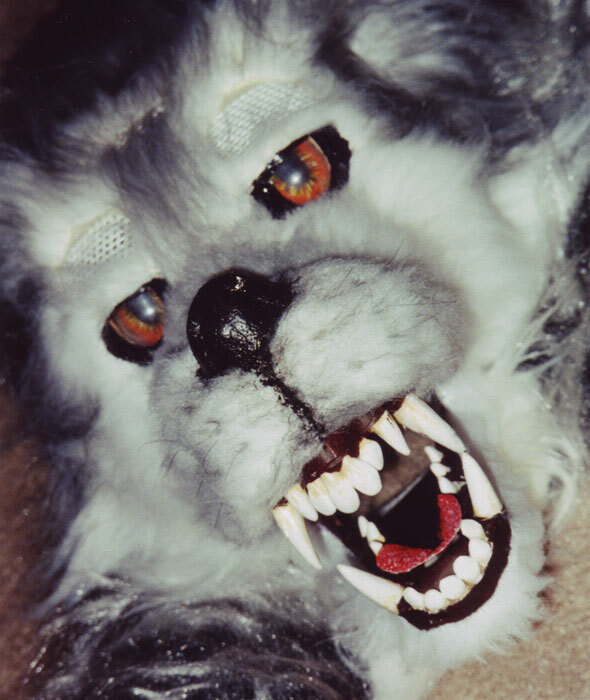 This mask used all white, to match the fur. In other words, I was mostly blind. The mask had a moving jaw, as is usual for me. 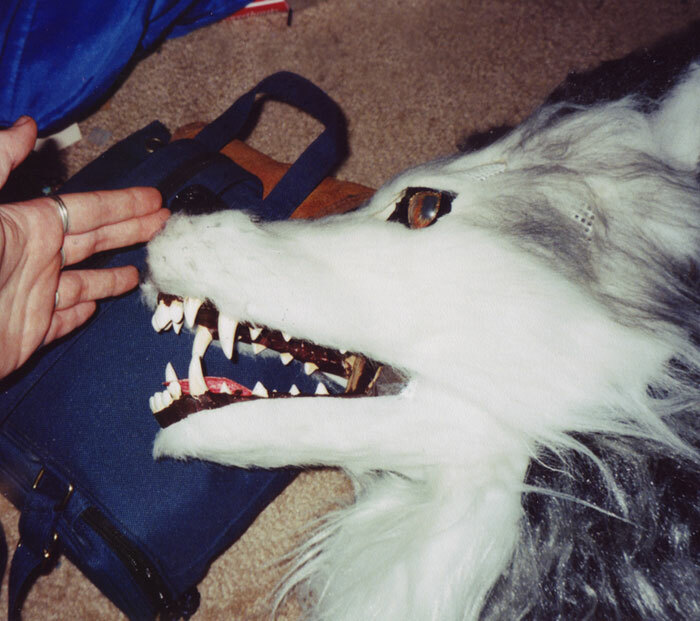 It also had a 'snarling' motion built into it, where the nose and lips could be raised to bare the front teeth. There was a piece of yarn attached inside that controlled the motion. I had hoped to be able to activate this somehow while in costume, but I wasn't able to figure out a good way to do it. I think the structure was a bit too weak for any kind of mechanical solution, anyway. It was at least possible to tie off the piece of yarn and hold the lips in a permanent snarl, for a slightly scarier look. The paws were hit-and-miss on this one. 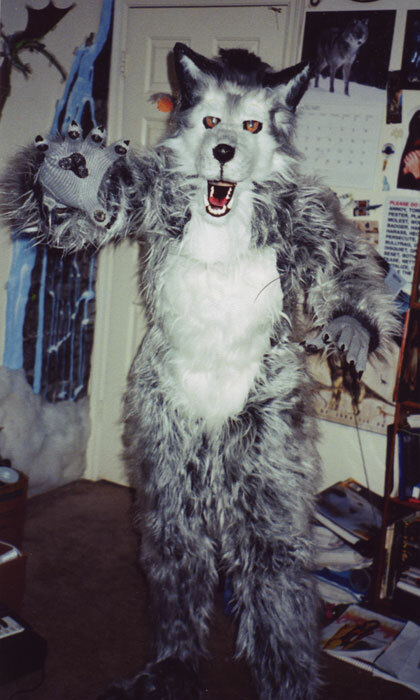 I cheaped out on the front paws and just attached claws and pawpads to a pair of gray gloves. 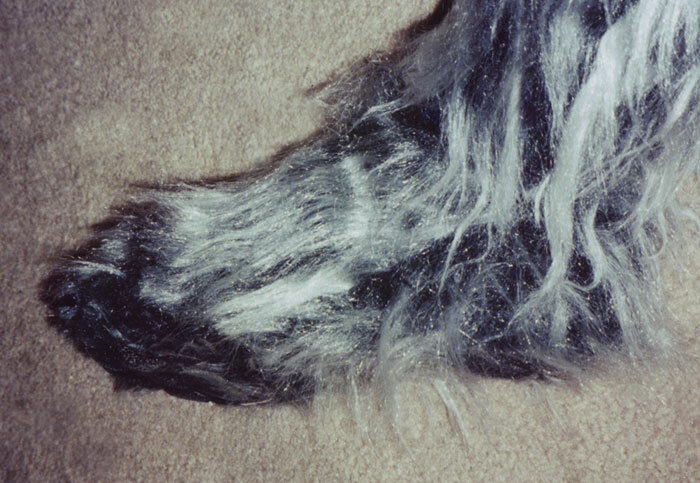 The back paws looked quite a bit better, though... actually having fur on them and all... The claws were cool. I made a claw out of ceramic and fired it, then used it to make several molds in ceramic clay. I filled the molds with this liquid acrylic stuff... It's supposed to be stuff you brush/sculpt onto your fingernails to make them very long and strong, but it worked great for this. The claws came out very nice, very claw-like. To finish them, I just painted them with black fingernail polish. The bodysuit was kinda fun... the closest thing I had to a pattern was setting some clothes on the fabric and cutting around them. I hadn't done much sewing before, but luckily the sewing machine and I get along pretty well. 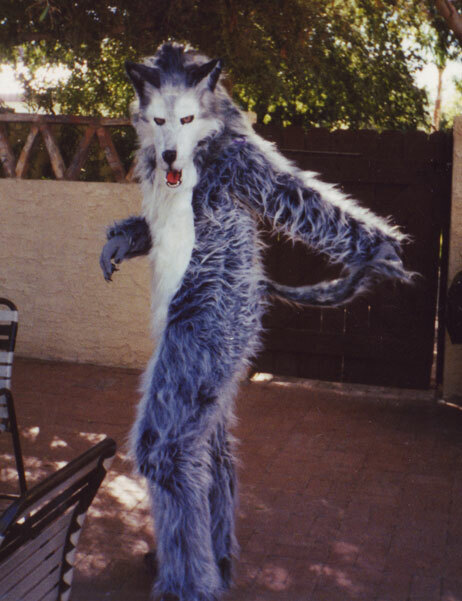 I actually did a better job on the sizing for this 'suit than for the one for my white werewolf. The white patch on the front is sewn on one side, and connects with velcro on the other, and underneath is a zipper. The tail was uninspiring, just a cone of fur, although the way I made it, it'd be a simple matter to make a support to go inside of it. 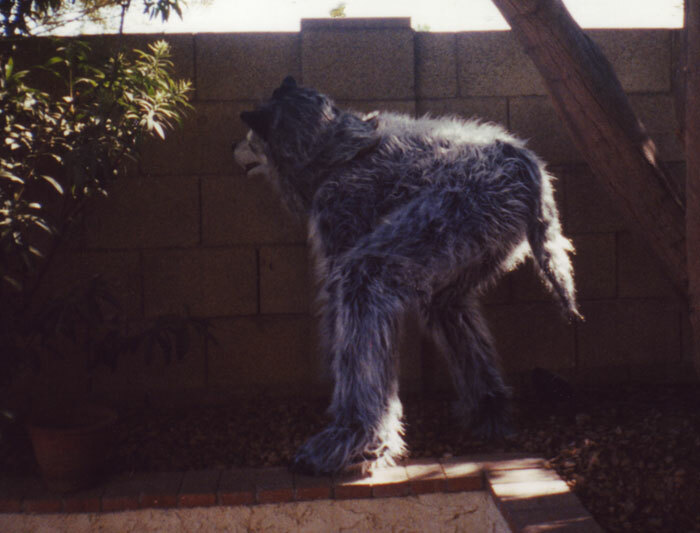 Also, it detaches from the rest of the fursuit, so I can just wear the tail around if I feel like it. 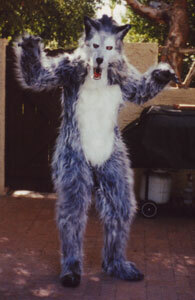 Though the mask isn't wearable at the moment, I borrowed the bodysuit for my Ashitare costume, and it worked out great. 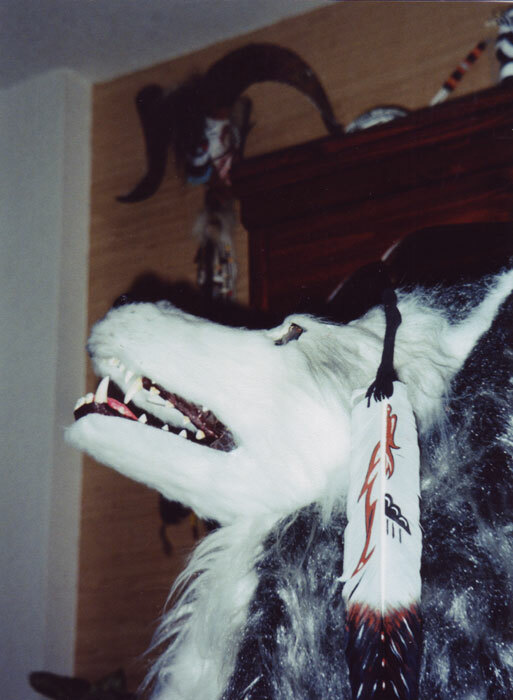 And, like I mentioned, I am, slowly but surely, working on renovating this mask. We'll see where it goes from here.